I honestly feel a little bad about how I judged this show from the start. The premise alone had me skeptical, thinking it had generic rom-com written all over it. While it indeed used its fair share of tropes, Masamune-kun’s Revenge managed to be surprisingly reserved and thoughtful with its plot and characters. The protagonist is pretty unique compared to what’s come before him in the industry/genre. He doesn’t hit that “handsome, oblivious, heart-of-gold” archetype at all, despite what he may look like at first glance. Masamune is a character with a clear ambition, one that is morally gray and hidden from every other character in the show (except Yoshino). His goal in the series is pretty much the sole cause for why he’s so different as a protagonist. As a fat child, Masamune experienced heartbreak that stung extra hard because of the hurtful nickname that was applied to it. The girl he liked called him “Pig’s Foot” and rejected him. It turns out Masamune took those words to heart, as he spent years working hard on his body and health, transforming into an irresistible stud for his high school debut. Unbeknownst to him, however, was that the girl who broke his heart years ago now goes to the same school. Not only that, she’s made quite a name for herself as being an extremely harsh rejecter of the hordes of boys that confess their shallow feelings for her. Now it has become his goal to do what no other person at this school could and make Adagaki Aki fall in love with him, only so he can then break her heart and have his revenge. Rather than a typical deadline for the narrative set by graduation, Masamune has a less than noble goal from the beginning of the series that confirms with us the existence of a planned ending. This sets him apart from generic high school slice of life rom-com protagonists in two ways: 1) While the show doesn’t shine him in a villainous light, he certainly isn’t innocent either, making him diverge from the average, good intentioned path of the cliché, teenage anime protagonist. 2) Masamune doesn’t exist solely to find his way in life. Coming of age and figuring out who you are is often a theme used in high school settings, and while I don’t think it’s inherently a bad one, it’s nice to see a protagonist that’s a little more focused on something in particular. One more thing that sets him apart is the fact that he worked hard to become what he is. Masamune-kun’s Revenge plays with the theme of superficiality. In anime, this typically isn’t an issue that comes across to the audience, because every character is created to look visually pleasant/attractive. 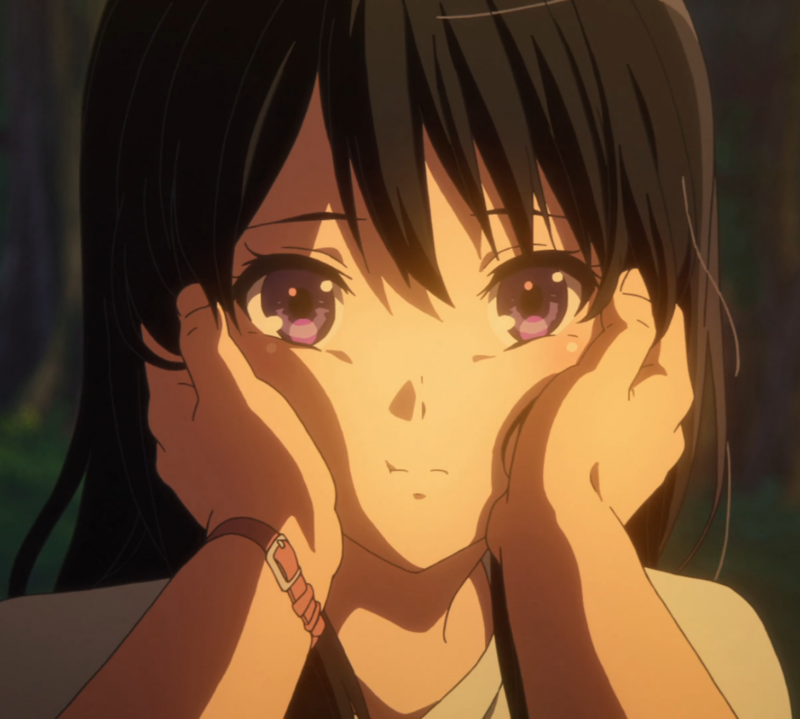 Anime characters don’t typically have facial blemishes, frizzy hair, weight problems, deformities, and so on. If you live in a world where physical attraction exists, appearances do matter and can get in the way of getting to the actual personality of a person (which is arguably the most important part). Usually in the anime world, everyone is attractive, meaning we can get right to the heart of the matter. Though that’s not the case for Masamune-kun’s Revenge. Masamune worked hard for his physique, which is more than you can say for a lot of anime protagonists. Furthermore, we get the perspective of a “health nut” through him, and can better understand what it really takes to look the way he does. When he stares at snack food, large, eye-catching text appears in the frame to label the amount of calories, giving us an idea of how he perceives the world. Masamune isn’t by any means an incredibly intelligent and rationally thinking character, but he does have a layer of calculability in his mind. His obsession with fitness comes at the cost of losing focus of everything around him. Masamune turns to manga because he doesn’t know how to have an attractive personality of his own, foolishly thinking that looking good would solve all his problems. There are parts in the show where he ignores his revenge quest to work on his body, only to come back feeling more distant from Adagaki. When it comes to Fujinomiya Neko, Masamune doesn’t even realize she has an illness because he writes off her excessive use of vitamin supplements as normal. It is this obsession, spawned from childhood heartbreak, that makes Masamune a unique protagonist. Without this element, I think the show would absolutely fall flat. Most of the supporting characters just don’t seem strong enough to stand up on their own, coming off as basic and archetypal. Without Masamune’s perspective, I doubt their interactions would be entertaining at all. In the end, I really enjoyed Masamune-kun’s Revenge. It wasn’t amazing by any stretch, but it wasn’t forgettable garbage either (make that a box quote). I’m definitely going to watch the next season when it comes around. Great post! It was a nice read and felt well thought out, good stuff.